Mother’s Day is only a week away. During this time of year, people often find themselves thinking about their mothers, or mothers find themselves reflecting on their time spent with their children. Whether all mothers realize it or not, she has the potential to be one of the strongest influencers in her child’s life, with the potential to lead by example, shaping the character of her child. I’m not planning to discuss all the wonderful aspects of being a mother, or the numerous abilities the Lord has given to moms. We already know moms were given some pretty special gifts that could only come from the Lord. What I am going to discuss over the course of this week are a few character qualities of three mothers from the Bible, and what we can learn from them right now. The first mother comes from a New Testament account found in Matthew 15: 21-28. This mother’s name was not given, but her action was impressive enough to be included in God’s Holy Word. At first, Jesus didn’t even answer her. He didn’t rush right out to this mom and meet her where she was. The healing didn’t come immediately. Her request wasn’t even acknowledged at first. Why? Perhaps Jesus was focusing on something entirely different – the faith of this mother. The disciples began encouraging Jesus to send her away, but Jesus responded that He didn’t come to only help the house of Israel. Was Jesus having a humorous moment with this lady during a very serious time for her? Or did she know right away that Jesus had every intention of healing her daughter? Either way, this mother’s sincerity and determination was seen. The Lord responded, “O woman, great is your faith! Let it be to you as you desire.” – And her daughter was healed THAT VERY HOUR! 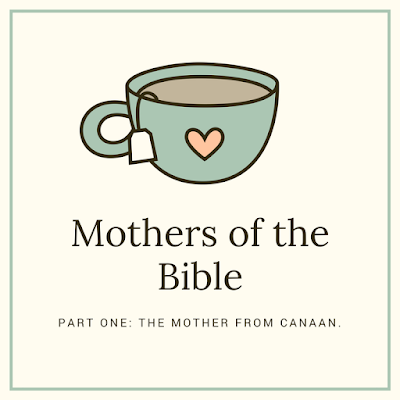 From this mother of Canaan, we learn the important lesson of faith and determination. She never gave up and believed that Jesus was the answer to her daughter’s healing. She had to step out of her comfort zone. She had to be bold. At the first sign of things not going as she probably planned, she didn’t run for the hills. She pressed on.